Uptown Digest should be your first port of call to find out the latest food and drink recipes as well the best, hot restaurants in both New York and Toronto. 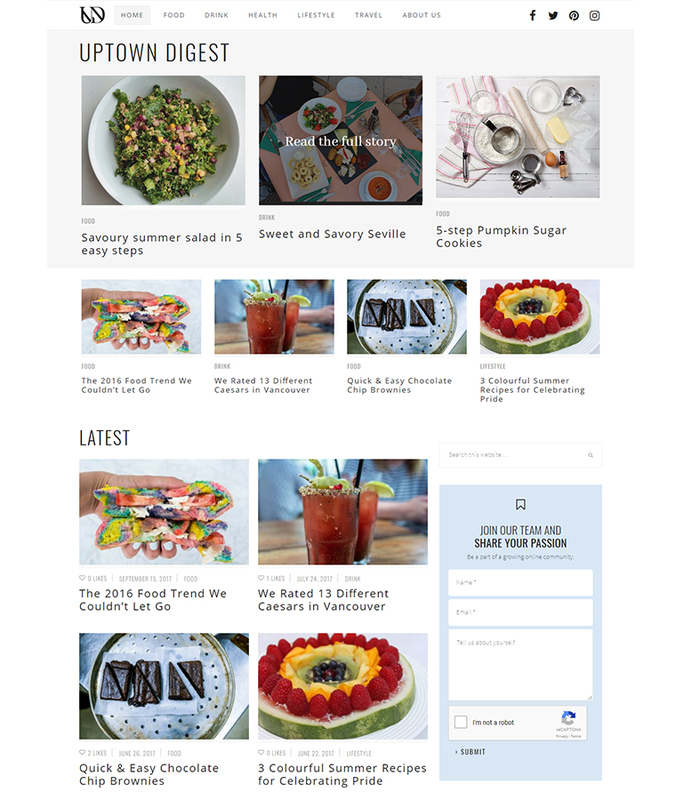 This WordPress website design has a stylish magazine look and feel, as well as being incredibly easy and fun to browse. In effect, the Uptown Digest website is very much an up market Blog website. It’s full of fabulously interesting articles that you could stop and browse for a good hour or so. But what exactly makes it so browsable? Design layout is key when creating a website like this. To capture the attention of visitors landing on the home page the website uses evocative high quality lifestyle shots coupled with minimal text. Visitors are then tempted in to discover more. Look also at the great use of ‘white space’. You’ll find this on many website designs within our portfolio. In the case of Uptown Digest white space allows a plethora of different blog articles to be displayed on the same page, yet visitors do not feel overwhelmed by this.